Cover of book (with pocket holding a card with the title), and a view of the book inside its slip case. Open book showing inside cover and title page (press information is fictional). Book with accordion partially open. I make artist books that combine digital and traditional printmaking techniques. Most of the books deal with issues of climate change. The books are either unique or made in very small editions. I design a format for each book that depends on the subject, the images and the materials I have at hand. 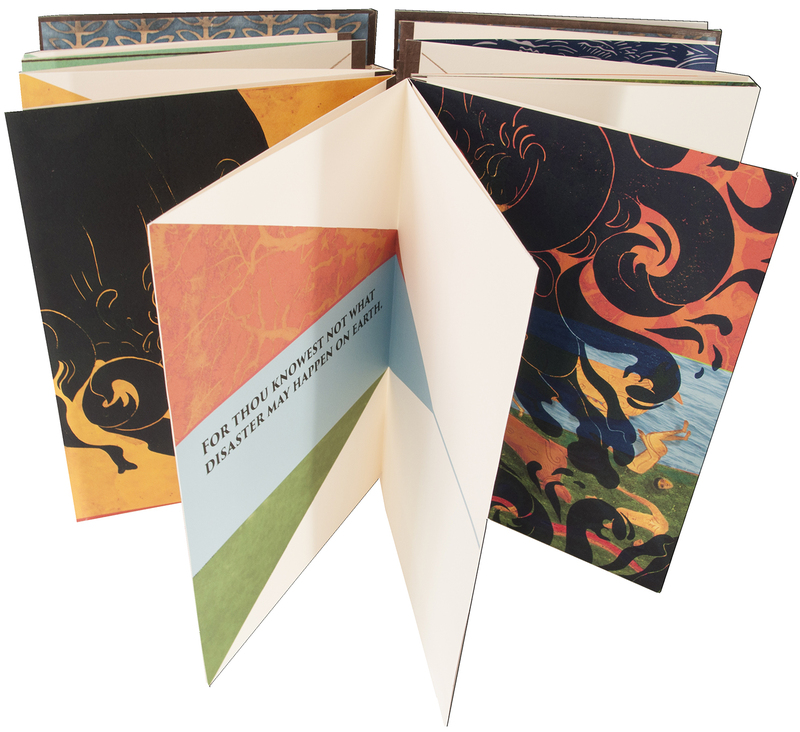 A Pocket List (sounds like Apocalypse) is a tethered accordion book with linocuts printed on top of digital images, with added colored pencil. The digital images are based on illustrations in a 10th century Spanish illuminated manuscript of the Apocalypse, combined with photos taken in New York City and the San Francisco Bay Area. The introduction was written by me in the year 3491 after climate change had destroyed much of the world we know, and the center of the remaining civilization had moved to the northernmost reaches of Canada. The page text is loosely taken from the Bible.